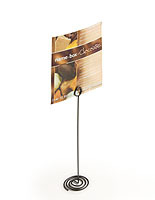 These card displays, memo holders have an attractive and upscale curved wire design. 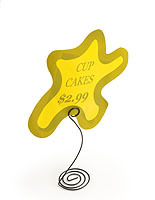 Use these note clips as an alternative to traditional pricing displays. These memo holders, also known as place card displays, are specially made from durable steel with a spiral shape for an attractive stand. Each sign clip is made from one piece of solid wire. 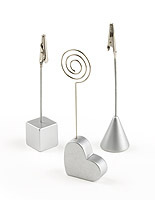 Elegantly designed, these memo holders are definitely typically used in retail stores and restaurants. 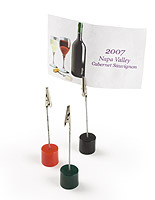 No matter what the location; these message clips will make a lasting impression on customers and guests alike. 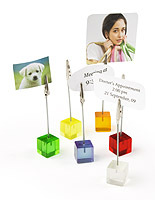 Memo holders, like these note displays and sign stands, can be used to present name cards, photos, items of the day or advertisements. 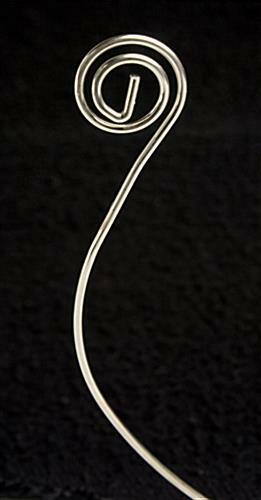 Place this silver wire stand in an office cubicle to display family pictures. 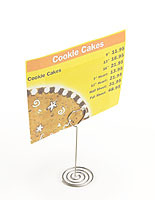 These sign displays, memo holders can be used to promote new products or daily specials. Restaurants and bars use these menu card displays to advertise food and drink specials. 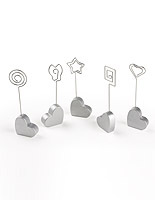 With these memo holders, cards or messages can easily slide into the wire loop. 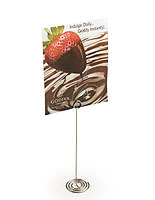 Place these eye-catching sign stands on any busy countertop to attract customer attention. We sell these memo holders in a box of 50 units. Purchase larger quantities to receive the lower per-unit pricing. 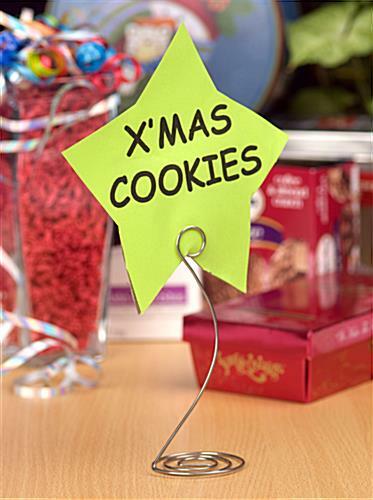 These memo holders are widely in used in places like restaurants, hotels, banquet halls, retailers and business offices. This was perfect and exactly what the picture looked like. I am going to use it for a Ladies Conference with a table number. I love that they were individually wrapped. Perfect!! We're so glad to hear this! Thanks so much for shopping with us.